A good weekend and start to the season for Cameron. Study and preparation for GCSE exams later in the year prevented any pre-season training and despite not arriving at the track until late on Thursday night. Friday practice saw Cameron out on the track riding for the first time since the end of last season but he was soon into the stride of things riding with determination. The qualifying sessions went well and Cameron’s confidence was building. 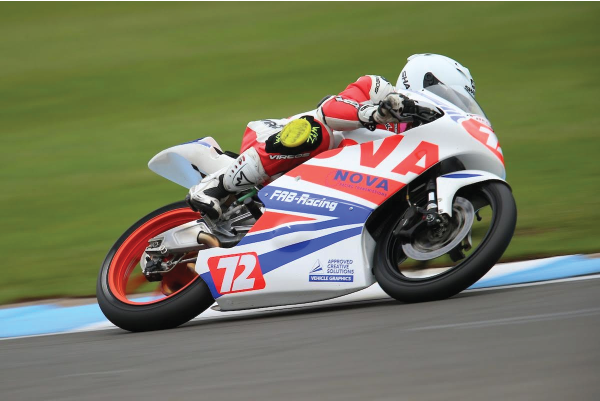 Saturday’s race saw Cameron pushing hard all the way and taking 3 rd place at the flag at the same time posting the fastest lap time of 1:42:807 for the Honda Standard machines. Second race of the weekend on Sunday, as the lights went out Cameron was off to a good start and chasing the leaders of the standard class. After a well fought race, frustrated at being held up in traffic towards the end resulted finishing 4 th . After the race Cameron said it was great being back on track and racing, he was pleased with the way the weekend had gone and having had a podium finish, looking forward to Brands in a fortnight’s time. This season is going to be a juggling act between racing and exams both of which I aim to do well in. Thank you to my family and everyone for their support.